Sam Barshop, born September 11, 1929 in Waco, TX, died on Monday, December 09, 2013. He was a graduate of Texas Military Institute, The University of Texas at Austin (BBA International Trade, class of 1951), and joined the United Stated Air Force - ranking as 2nd Lieutenant 1951-1954. Mr. Barshop is founder and retired Chairman of the Board, President and CEO of La Quinta Inns, Inc. In September 1995, he combined Barshop Enterprises of San Antonio and C.P. Oles Company of Austin to form Barshop & Oles Company, of which he was Chairman and later Chairman Emeritus. Barshop also served for many years as a director of Southwest Airlines. Barshop had a keen interest in higher education and served on the Board of Regents of The University of Texas System (1987 - 1993; Vice Chairman, 1989 - 90), the Texas Higher Education Coordinating Board, the University of the Incarnate Word Board of Trustees, the Governor's Task Force on Higher Education, The University of Texas at Austin Development Board, the Development Board of the University of Texas Health Science Center at San Antonio, and The University of Texas at San Antonio Development Board. He was a recipient of The University of Texas Ex-Student's Association Distinguished Alumnus Award and was a member of the UT-Austin College of Business Administration Hall of Fame. He also served two years as Chairman of the Princeton University Parents' Association. Barshop was involved with numerous civic organizations, including the Southwest Foundation for Biomedical Research (Board of Directors), the San Antonio Free Trade Alliance (Chairman 1996), the Service Policy Advisory Committee to the United States Trade Representative (NAFTA), Texas Special Olympics (Chairman 1993), United Way of San Antonio and Bexar County (Chairman 1988), the Texas Turnpike Authority, the Austin-San Antonio Corridor Council, and the Advisory Council of San Antonio Academy. 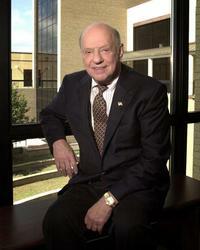 His many honors include The Americas Lodging Investment Summit Lifetime Achievement Award, Ernst & Young Entrepreneur of the Year Lifetime Achievement Award, the Hall of Honor at the University of Houston Conrad N. Hilton College of Hotel & Restaurant Management, the San Antonio Business Hall of Fame, the San Antonio Academy of Texas Colonel W. T. Bondurant Sr. Distinguished Humanitarian Award, the San Antonio Technology Accelerator Initiative (SATAI) Technology Hero Award and the Texas Philanthropy Hall of Fame (together with wife, Ann). Sam and Ann Barshop co-founded The Sam and Ann Barshop Center for Longevity and Aging Studies at the UT Health Science Center-San Antonio in 2001. Until the Fall of 2005, Sam Barshop held the Roy F. and Joann Cole Mitte Chair in Entrepreneurship Studies at Texas State University. Executive Assistant to C. Patrick Oles, Jr.
© Copyright 2019 Barshop & Oles.